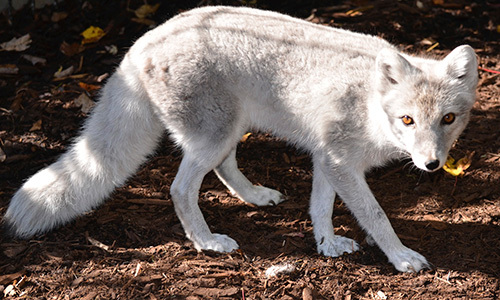 Description: Arctic foxes range in colour from white to bluish-grey in the winter to greyish-brown in the summer. They can reach 85cm (34in) in length, including the tail, measure up to 30cm(12in) at the shoulder and can weigh up to 3.5 kg (7.7lb). 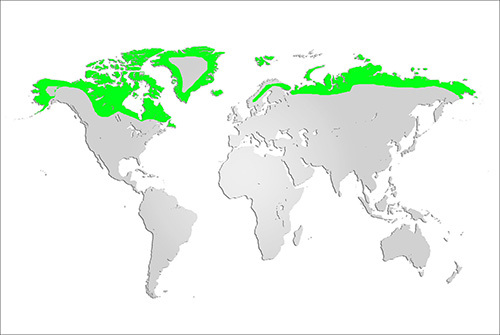 Distribution and Habitat: The arctic fox is found arctic tundra habitats in northern Europe, northern Asia and North America. In Canada the arctic fox is found as far south as the Hudson Bay. Diet: Primarily carnivores, arctic foxes are opportunistic, eating lemmings, voles, other rodents, hares, birds, and eggs. When necessary they will scavenge on carcasses left by larger predators such as wolves and polar bears. When available, lemmings are their most common prey. The arctic fox population tends to fluctuate in a cycle following the population trends of lemmings and voles (a 3-to-4-year cycle). Life Cycle: Monogamous breeding pairs typically mate in April or May with a litter of 5-8 kits born about 52 days later. Both parents work to raise the young which are weaned by nine weeks of age. Adaptations: Arctic foxes can increase their body weight by more than 50% in the autumn by increasing fat reserves to provide more insulation and energy for the arctic winter. Furred foot pads and a complex circulatory system in their feet keep them from freezing on the snow. Arctic foxes have a lower setting on their internal thermostat; their body doesn’t recognize cold until ambient temperatures reach far below what would cause other fox species to shiver and seek shelter. Did you know? Arctic foxes do not hibernate and live in large communal underground dens with complex mazes of tunnels.